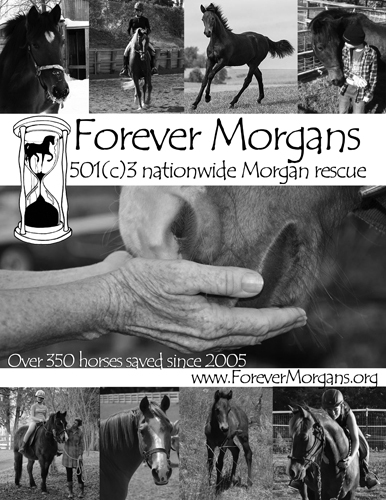 Keep up to date on the latest FM rescues and activities by following Forever Morgans on Facebook. Pampered show horses discarded when they no longer brought home ribbons, pleasure riding horses whose owners had financial problems or lost interest, and Amish buggy horses who spent years pounding pavement and pulling heavy loads. They are unwanted, possibly old or injured. They may pass through multiple owners, each one wringing all that they can from the horse before selling it on. Many end up crammed onto slaughter trucks for a terrible fate. 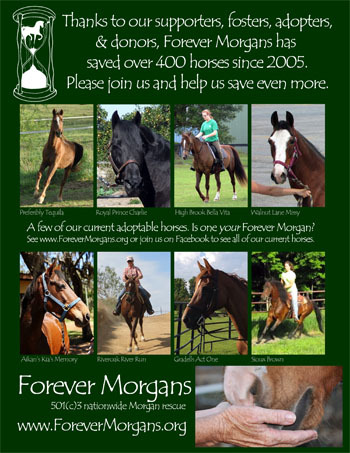 Forever Morgans is working to reach horses before they start this downward spiral. When we contact the former owners of rescued horses, they often say they didn't know of options other than sending the horse to auction or selling it cheaply to a broker. 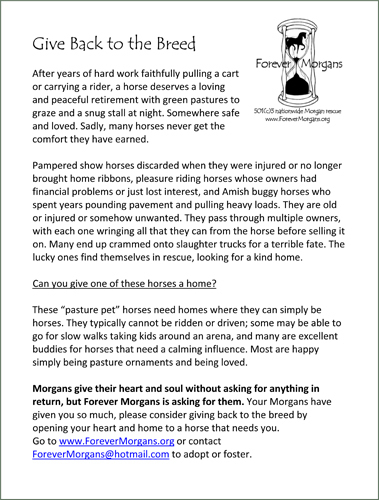 They are thrilled that Forever Morgans exists and relieved that the horse is safe. Many have contacted us to help find homes for subsequent horses. Educating people that there are other options saves lives! Are you going to a horse show or event? Part of a club or youth group? 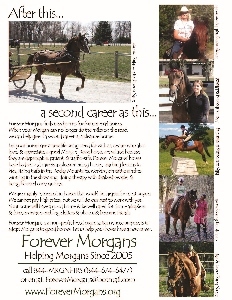 Would you like to help spread the word about Forever Morgans? Please consider helping at an informational booth or posting flyers. It can be as simple as printing and posting a few flyers about FM and available horses, or you can go all-out and have a booth with banners, merchandise, and a presentation about FM horses. 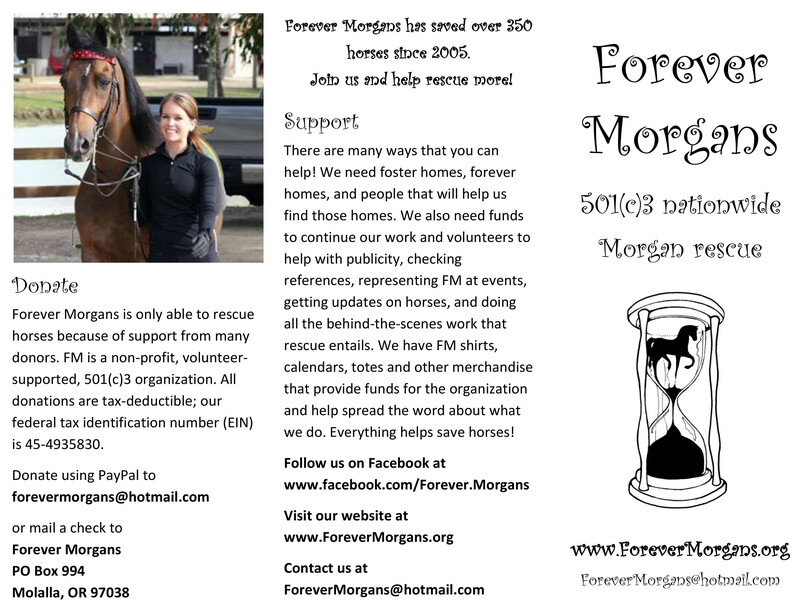 FM especially needs people who are willing to take an FM foster or adopted horse as an example of the horses we save. 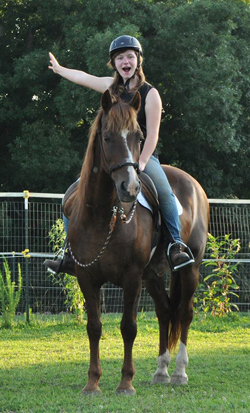 You could be the one who helps a horse find its forever home! Your gas and other expenses may count as tax-deductible donations for FM. With prior approval, most shows will waive the stall fee for an FM horse being presented. So if you have an FM horse and are going to a show anyway, please consider representing FM! 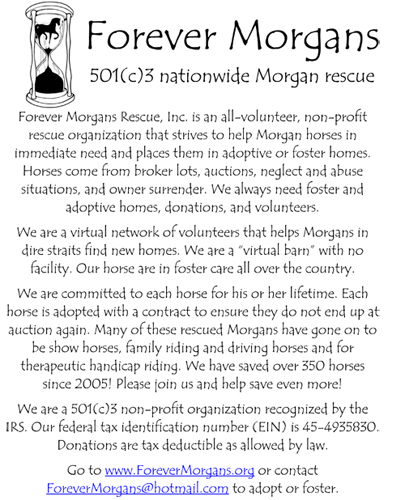 Please email the Board at forevermorgans@hotmail.com if you would like to volunteer! Ads and informational sheets can be downloaded and printed, then used to promote FM at events. Ads for individual horses are available on the Available Horses page. Please feel free to print and share! Click on the image to open a full-size printable version in pdf format.